This fish hawk is specially adapted for its piscine diet. It has both a hind toe and a rotating, opposable front toe. When carrying a fish, the two normal front toes of both feet are on one side, and the hind toe and “thumb” toe on the other side, balancing the hold. Osprey nest at the pinnacle of sturdy trees or on power poles and other tall structures. 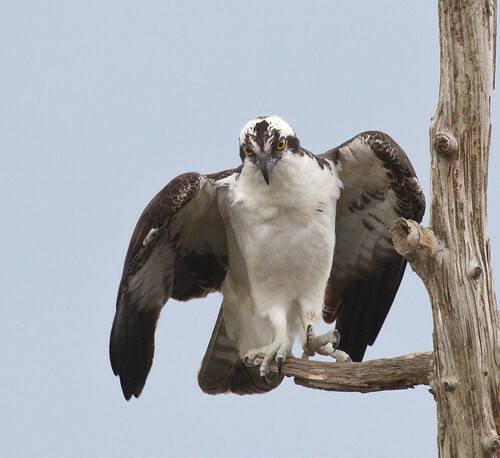 Bald Eagles pose a threat, and when nesting nearby, they keep nesting Osprey on high alert.